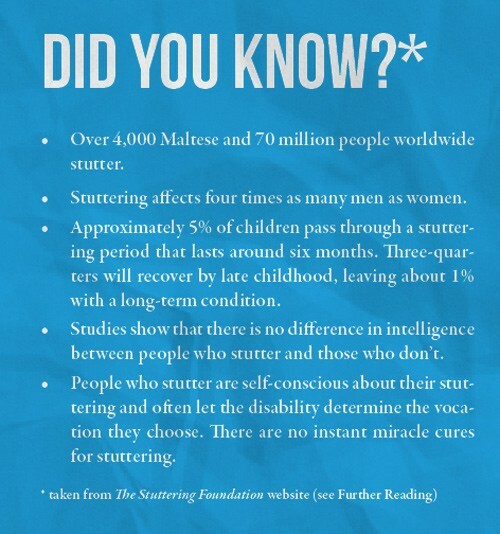 Stuttering affects around 70 million people worldwide. This amounts to one percent of the world’s population. In Malta, this means that over 4,000 people stutter. I am one of them, so I was really looking forward to meeting the speech language pathologist Dr Joseph Agius. Dr Agius didn’t start off treating his clients using humour. “My first client was an 8 year old child who stutters. After two months, he became very fluent under a fluency shaping programme. It’s a behaviour programme, like when you use slow speech to stutter less [ED: a technique I use] or when you use some modifiers to relax your vocal cords — prolonging speech. So he became fluent, discharge, success. Ten years later, I met his mother again […] he’s very depressed, he doesn’t want to go to a psychiatrist, he wants to come to you. I thought this must be a relapse. When I met him, he was still fluent, but he kept saying that he stutters, he stutters. […] It took me ages to understand. His mind was still viewing himself as a child. That perception remains. Then I realised that we can’t just work on fluency, but also the attitude.” This led Dr Agius to laughter. 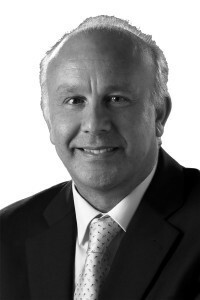 In 2007, the ‘Think Smart, Feel Smart’ strategy showed his vision to incorporate creativity and humour to change attitudes. The ten session programme focuses on developing thinking skills to help people (usually school age children) with stuttering. The main idea is that by changing thoughts, a person’s feelings can be changed. For stuttering this is perfect, since although stress or anxiety do not cause stuttering, stressful situations can make it much worse. Dr Agius illustrated the power of changing attitudes with a story about a stuttering nurse*. A girl phones me crying and crying, I had to do something. I asked her if stuttering had helped her in some way. And she told me: ‘as if it never helped… well, maybe, I’m a good listener, I’m very sensitive.’ Like this, I showed her how it was a gift. ‘You know its true, without stuttering I don’t think I would’ve become a nurse’. The nurse now is a regular public speaker. But to develop public speaking skills, the strategy also incorporates Dr Agius’s earlier methods of fluency shaping and basic communication skills. For example, every eight minutes the presenter should show a clip, crack a joke, and so on since that’s the limit of our attention span. A major difference is that the programme makes it fun. Humour helps people enjoy it providing the motivation they need to stand and speak on the pulpit. And that’s exactly what Fr Ivan Scicluna (another client of Dr Agius) had to do in front of 150 other religious figures at a mass in Rome.‘I cannot go up on the pulpit and give a sermon.’ I asked him if he ever talked about it to his parents. ‘No, no how could I tell my parents, that’s unheard of’. Friends? ‘No, no.’ Then I managed to convince him that he can be a very good public speaker even though he stutters. I managed to do that by training him in public speaking. While studying in Rome, he sent me an SMS: ‘You were right Joe, I have just addressed 150 Capuchin brothers, yes I stuttered but it went excellent.’ He then told me that he wants to do a thesis on spirituality and stammering and was wondering if I knew other priests who stutter. This person who never wanted to talk about stuttering wrote one of the nicest theses that I have seen called God’s Power made Perfect in Weakness: Towards a spirituality for stuttering priests. Harry Potter also features in his approach. In the third Harry Potter movie, Professor Lupin (a good werewolf) teaches the children to cast the Riddikulus charm against Boggarts. The creature terrorises its victims by taking the shape of their most feared nightmare. The spell changes the fear into something ridiculous. For example, the wizardly school children turned their most feared teacher into a cross dresser. “In psychological terms this is desensitisation, using humour as a desensitisation technique. You are having fun and enjoying the sessions and perceiving that it [stuttering] is not a problem. I do not use the word problem, I do not see it [stuttering] as a problem […] but a condition”, said Dr Agius. The programme was developed into the Smart Intervention Strategy, targeted at school children who stutter. By documenting the strategy and comparing it with a control group that received a different programme, he showed that “there is a significant positive change in attitude towards communication and themselves” — it helped people cope with stuttering. The research formed part of his doctorate and the strategy is now being used all around Europe. In the movie The King’s Speech, King George VI is seen spitting out pebbles after being treated for stuttering. The King obviously wasn’t helped, but he had it easy. Others before him had their tongues cut, reduced in size, chopped off, golden forks placed to support the tongue, and even more bizarre treatments. Today the real cause of stuttering is still unknown, however several clues are appearing from genetic and brain studies. Dr Dennis Drayna and his team identified three mutations in Pakistani and North American families. The three genes which malfunctioned in stutterers are related to the cellular lysosomal pathway, which sends proteins to the cell’s garbage dump. It’s a bit unclear how this is related to stuttering. Another study by Professor Shelly Jo Kraft, Wayne State University gave more promising clues. A genome-wide association study linked stuttering to 10 genes in the development and function of neurons, plus behaviour. The above nods towards stuttering running in families. “60% of my clients have a family member who stutters” mentioned Dr Agius. People can be predisposed to stuttering, in my case (the author): I had my mom. She grew out of it, I needed speech therapy and a lot of willpower. If your child is developing a stutter it’s much easier to take them to a therapist at an early age, with much higher chances of success to learn coping skills. The genetic study also hinted towards the brain, rather than the tongue, being responsible for stuttering. The idea is supported by brain imaging studies on adults. Dr Agius referred to recent studies showing the over activation of the right side of the brain rather than the left. Auditory processing is the most activated brain area. To find out if the hyperactivity causes stuttering—or the other way around — scans need to be performed in children. Unfortunately, scanning children is unethical since it requires utter stillness and long exposures that can be dangerous. On the plus side, recent technological advancements might make the studies possible and really find out what causes stuttering. What is clear is that the ancients had it all wrong and stuttering is hereditary and mostly based in the brain. – King George IV. Higly popular King of Great Britain during World War II, immortalized in the movie “The king’s speech”. – Nicole Kidman. Award-winning actress known for “The Hours”, “Batman Forever” and “Moulin Rouge”. – Bruce Willis. Action movie actor who rose to fame with the “Die Hard” series, followed by “Pulp Fiction”, “Armageddon” and “The sixth sense”. – Samuel L. Jackson. Activist and actor known for “Goodfellas”, “Jurassic Park” and “Pulp Fiction”. – Isaac Newton. One of the greatest scientists who ever lived famed for his work on light gravitation, and the three laws of motion. Research into the benefits of humour started in the 1980s. The magazine editor Norman Cousins had very severe and painful arthritis. After discharging himself from hospital, he started watching candid camera and comic movies at home. He noticed that 10 minutes of laughter reduced his pain by two hours. The observation motivated him to write the book Anatomy of an Illness. It wasn’t research, but inspired artists and scientists alike, which led to numerous studies. Dr Rod Martin reviewed all of the literature investigating the beneficial health effects of humour. Immunity, blood pressure, diabetes, and more have been studied, but pain tolerance shows the greatest consistency. The idea is that having a laugh will make you feel better and reduce chronic pain. The other conditions, while exciting, haven’t borne consistent fruit and await further research. Humour’s role in relationships is another hot topic. According to Dr Agius the trend tends to be that “a girl wants someone who makes her laugh, a guy wants someone who laughs at his jokes.” He continued by explaining that this holds true in the beginning of the relationship, later on when the relationship gets serious “a girl doesn’t want someone whom she is telling something serious and he changes it into humour. Girls can’t stand this. In a well established relationship a sense of humour can detract.” The dark side of humour is also under study. Gelatophobia, or the fear of being laughed at, is a big research area. Dr Agius collaborated with researchers from the University of Zurich who wanted to know how many people suffer from the condition. Malta topped the charts with 33.7% of people compared to Switzerland’s 5%. Dr Agius explained, “being a small island everyone knows everyone, also because we were a colony we have a bit of an inferiority complex. They all contribute to make us rather obsessed and suspicious about what others are thinking.” Malta’s results were comparable to Fiji, another island. The studies indicate that if you’re in a group and hear someone laugh, around one third of Maltese would think: yes they must be laughing at me, and not in a good way. “This is our Maltese character,” said Dr Agius. Together with an international team, he is now studying how gelatophobia affects stutterers. 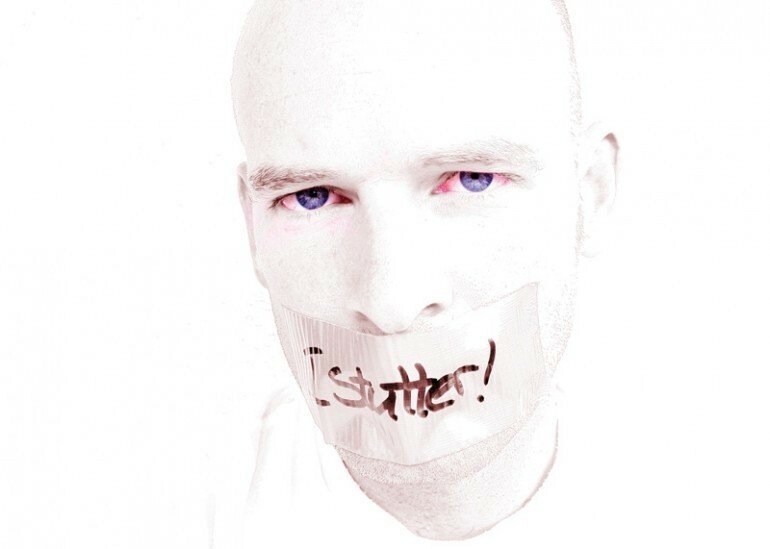 In general, people who stutter tend to find laughter malicious, they don’t like being teased. In non-stutterers it sometimes helps relationships. The extent of the phobia gets even worse. In non-social laughter, when stutterers even hear any laughter it causes discomfort. Even reading a comic describing laughter can annoy stutterers. “People who stutter tend to view laughter as evil and associated with bad emotions”. This could be related to bullying, but that question awaits other studies. Part 2 of the article will talk about the work of Dr Helen Grech who developed an assessment tool to detect speech and language problems in Maltese children. Read all about it in the next issue of THINK. – McGhee, P. Humor. The Lighter Path to Resilience and Health. 1st edn, (AuthorHouse, 2010). – Agius, J. G. The ‘Smart Intervention Strategy’ for School Age Children Who Stutter. Themanummer Logopedie: Special Issue Speech Fluency 4, 4–11 (2012). – The groundbreaking initiative that incorporates Dr Agius’s approach. I have used laughter as a tool to help overcome my stuttering, if I get the person I’m talking to for the first time to laugh it calms my nerves and I have a higher chance of not stuttering. I have almost all but healed myself with that. Is there any proof behind the fact that laughter can help with other ppl who stutter?